These easy no bake cherry cheesecake bars are sure to be a hit with family and friends. Whip up a batch or two today! I am such a sucker for cherry flavoured desserts. Cherry cheesecake is one of my favourite things in the whole wide world. I can never get enough of it. If it was socially acceptable to each it for lunch every day I totally would. There is just something about cheesecake that just brings on “the happy”. It’s hard to be in a bad mood while eating cheesecake. I mean think about that. Have you ever seen a person scowl while eating cheesecake? Nope. It will never happen. For me the reigning champion of the cheesecake world is, and always will be, cherry. 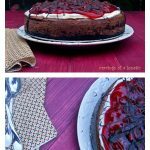 Whether it’s a true baked version, a no bake cherry cheesecake, a black forest baked cheesecake, or a no bake black forest cheesecake, they will make you happy. 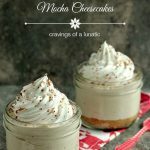 I tend to make a lot of no bake cheesecakes. Not that I don’t like the baked versions but I love the idea of a lighter cream cheese touch. I’m not a fan of heavy desserts on a day to day basis. When I make no bake they get gobbled up quick. Heavier cakes tend to assure leftovers in our house. For some reason, one of my hooligans does not like cheesecake. I am really starting to question whether she was switched at birth or something. She’s the only member of the family who is not a fan of cheesecake. She is the one person in the world who will scowl at cheesecake. We have tried to get her on board the cheesecake train. Repeatedly. She just won’t do it. It bums me out because I make a ton of cheesecake so I feel like I’m leaving her out when I make it. Usually, I’ll make her a similar dessert with whipped cream. She loves that stuff. She keeps telling me it’s the smell of it. She works in produce at our local grocery store. They make a taco dip with cream cheese and she just hates the smell of it. So she just cannot bring herself to eat cheesecake. Such a big, old bummer. On the plus side…more for ME!!! Parchment Paper– Every baker needs parchment paper in their pantry. This brand is my favourite. Kitchenaid Stand Mixer– This is a serious investment but totally worth it. I use mine daily. Get the best one you can afford. I have a bowl lift but I’m also hoping to get a tilt head for baking videos. Hand Mixer– I have a couple of cheap ones but I’m currently adding this one to my cart because it’s so darn pretty and powerful. Hand mixers are something everyone should have. Buy what fits your budget and needs. This was originally posted on Real Housemoms when I was a contributor there. 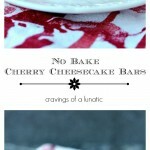 You can see these No Bake Cherry Cheesecake Bars on their blog. 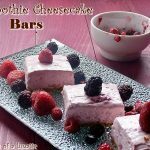 No Bake Cherry Cheesecake Bars Video added on September 15, 2017. Enjoy! 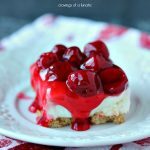 No Bake Cherry Cheesecake Bars Post last updated on May 14, 2018. Now let’s make some cheesecake! 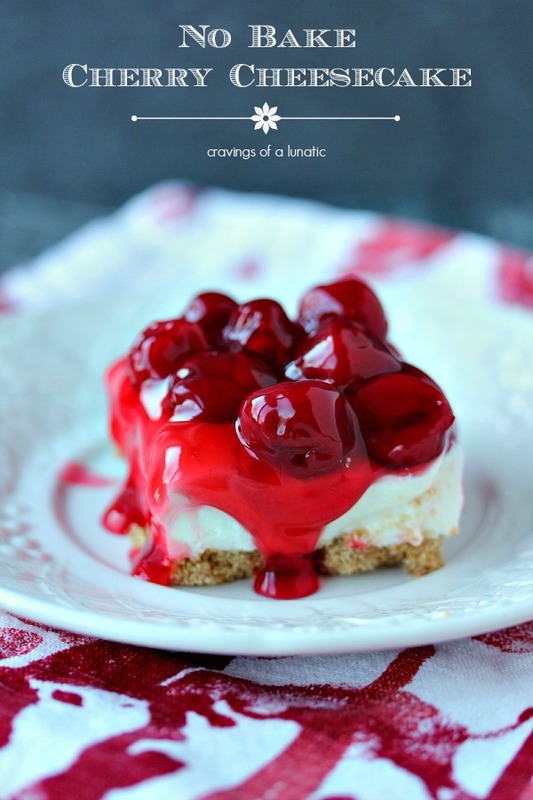 These no bake cherry cheesecake bars are sure to be a hit with family and friends. Whip up a batch today! Line an 8 x 8 inch square baking dish with parchment paper. Set aside. In a small mixing bowl combine the graham crumbs and butter. Mix until combined. Pour into baking dish, and press down to form the crust. In a mixer using the paddle attachment combine the cream cheese and the sugar. Mix until it becomes light and fluffy. In a separate bowl mix the heavy cream on low at first, then increase speed to high. Mix until the heavy cream becomes whipped cream. It should for peaks. Pour the whipped cream into the cream cheese mixture. Mix on high until combined. Scoop into the baking dish and smooth out with the back of a spoon or spatula. Spoon the cherry pie filling out evenly over the top. Smooth out carefully. Pop the dish in the fridge for at least 4 hours, but preferably overnight. Remove and cut into squares. 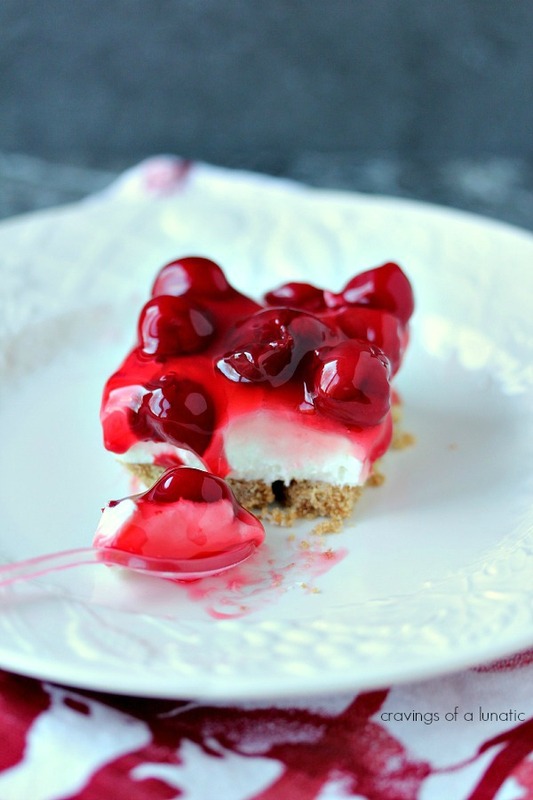 Serve with a big old cherry cheesecake loving smile! Recipe can be doubled and prepared in a 9 x 13 inch dish instead. You can substitute 1 cup of prepared whipped cream (like cool whip) if you prefer not to whip your own. 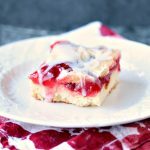 I promise these no bake cherry cheesecake bars will be a huge hit with your family and friends. If there’s any left to share with them. I usually gobble them all up before I get a chance to share. Oops, my bad. Check out my recipe index for more amazing recipes. You can find more dessert recipes and tons of snack recipes. This looks great, Kim! And I love, of course, that there is heavy cream in the recipe, hehe. if it has cream in it, I KNOW I’ll love it! Right. Me too. Heavy cream = happiness. Gorgeous looking stuff. And I’ll bet awfully tasty, too. 😉 I’ll eat any of this that your hooligans turn down! Ha, this made me laugh. Anything that even starts to look like cheesecake flavors, I am all over it. No bake and cherries—I am looking twice—even three times. Ha! Ha, thanks Carol. I’m the same way. I’m addicted to cheesecake. Ha, thanks Ramona. I love me some cherry cheesecake. I am a sucker too… For cheeckeake that is! 😀 I love the look of this one, mouthwatering!!!! Thanks for the great recipe! I’m going to have to try it this weekend! Hope you love it Khady. Oh wow! They look so good with the cherry oozing over the sides! This is my favorite kind of dessert! I agree 100%. Cherry is the reigning king (queen?) of cheesecakes. Hands down. 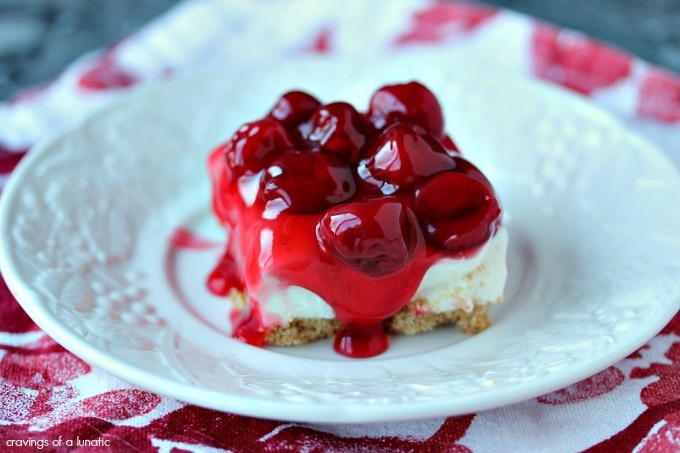 These cherry cheesecake bars look great!! 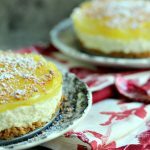 I’m all about no bake!